I began some broccoli seeds indoor this year, but I didn’t have very good results. So I thought it would be a wise decision to buy a pack of plants to make sure I ended up with something. I picked up a pack of 4 Packman broccoli plants at my local farmer’s market. Here is some information on this variety of broccoli. Click here to read all my posts on Packman Broccoli. This variety produces large heads with good side shoots after the main head is harvested. This is something I look for when picking out broccoli. You want to have more than one harvest out of a single plant. As with all broccoli, this one needs full sun. Plant in rows about 36 inches apart. These plants take up a lot of space, so make sure to give them the room they need. I planted mine in a raised bed in my community garden plot. To learn more about what a community garden is, click here. Either start seeds indoors in late March/early April for transplating in late April/early May. If you live in a warm climate, you will need to plant it earlier before temperatures are consistently in the mid 80s. 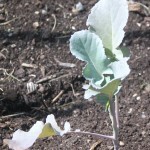 Broccoli can always be grown for a fall harvest with a planting in mid-summer. This way your broccoli is maturing in cooler temperature so it is less likely to bolt. When broccoli bolts it becomes very bitter and you would not want to eat it. It takes about 55-65 days from transplant to harvest. This makes it an early variety. If you are starting from seed add another 35 days. 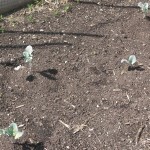 So I transplanted my Packman broccoli on Monday, May 3, 2010. So my estimated time of first harvest is Sunday, June 27th to Wednesday, July 7th. Since by then we could be seeing hot temperatures I will have to make sure my broccoli stays cool on hot days so that it won’t bolt.